International observers of Somaliland’s presidential election on 13 November 2017 arrive in Somaliland, hoping for a successful and peaceful poll. A first press release has been produced. Ahead of Somaliland’s third presidential election on 13 November 2017, the first members of a team of 60 international election observers have arrived in Hargeisa. 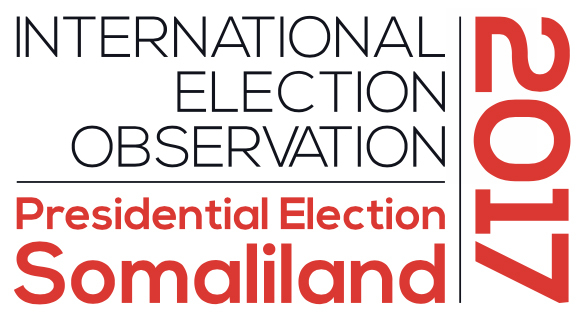 The international election observation mission (EOM) has been invited by Somaliland’s National Electoral Commission (NEC) and is funded by the British government. The EOM will conduct its observation activities in accordance with the Declaration of Principles for International Election Observation, emphasising the impartiality of that observation. The EOM is led by the DPU, and coordinated by Michael Walls. This EOM marks the fourth election in Somaliland observed and reported on by DPU and Somaliland Focus since 2005. As the third presidential election (following the polls in 2003 and 2010), it is the first poll to use a new voter registration system, which itself marks the first use of iris-scan biometric technology in an African election. The election was delayed by devastating droughts in 2016 and 2017, and comes at a time when Somaliland is attracting significant infrastructure investment from the Middle East and alongside Somalia’s own efforts to rebuild its shattered political system. The EOM is particularly hopeful that the implementation of the voter registration system will address issues that have marred previous elections, and looks forward to commencing its mission.